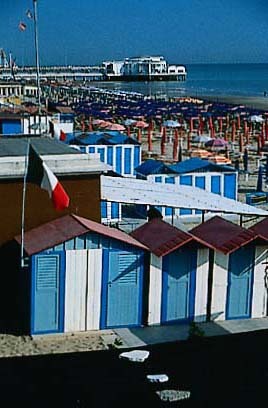 Since 1853 Senigallia has been one of the most popular seaside resorts on the Adriatic Coast with its thirteen kilometres of golden sands, the famous Velvet Beach. Thanks to the quality of the services it provides and the clean and safe bathing, the town has been awarded the prestigious Blue Flag of the Foundation for Environmental Education in Europe. But the sea is not the only reason for choosing Senigallia. It has a beguiling old centre and offers an ideal base for exploring inland Marche towns. 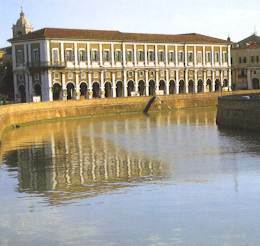 Although its prosperity nowadays depends on the tourists, it is a town with a long history. Its name bears witness to its earliest inhabitants - the Galli Senoni, a Celtic tribe who settled here around the 4th century BC. In the 15th century it was widely celebrated for its enormous commercial fair - the Maddalena Fair. Still today its old centre has a certain solid mercantile grandeur, particularly in the tall old blocks that line the canal. While wandering through the lanes of the centre also notice the low, thick-walled style of many of the buildings - specially designed in centuries past to avoid earthquake damage. The finest monument is the old fort, the Rocca Roveresca, built in 1480. In the summer its courtyard echoes to the sound of classical music concerts. Senigallia's other great pride is the number of good restaurants where you can, naturally, eat the best of the Adriatic catch. Two of Italy's most feted restaurants are here, regularly featured among the top ten in all the guides.